NORTH EASTON, Mass. – Just when it looked like Oliver Ames had let a win slip away, the Tigers snatched victory from the jaws of defeat with a seventh-inning comeback. 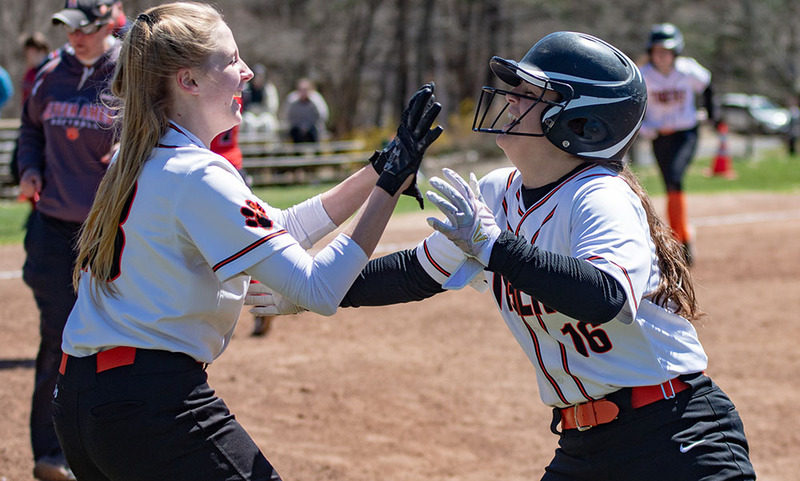 Oliver Ames scored five runs over the first five innings, and the combination of senior pitcher Kaya Georgeu and strong defense kept visiting Whitman-Hanson off the board. 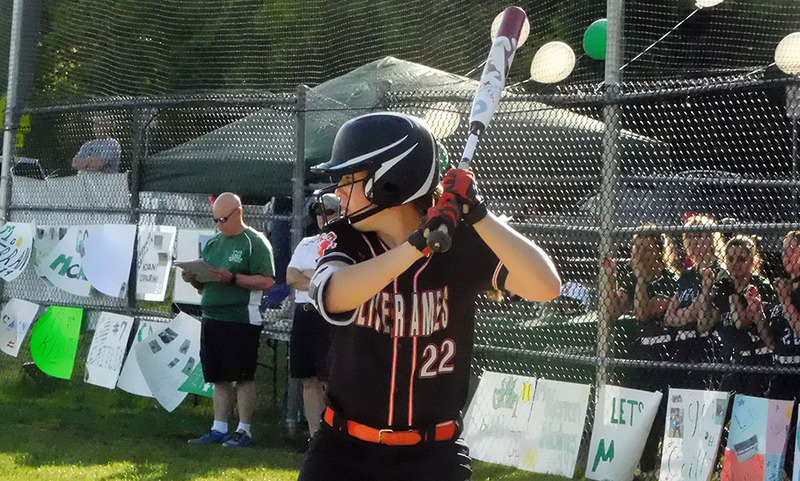 But that all changed in the sixth inning when the Panthers plated four runs to get within one and then stunned Oliver Ames with a three-run seventh inning to take its first lead of the game. A leadoff double from sophomore Emma Varella in the bottom of the seventh seemed to steal the momentum back for the Tigers, who used four straight hits in the inning to get their first win of the season. 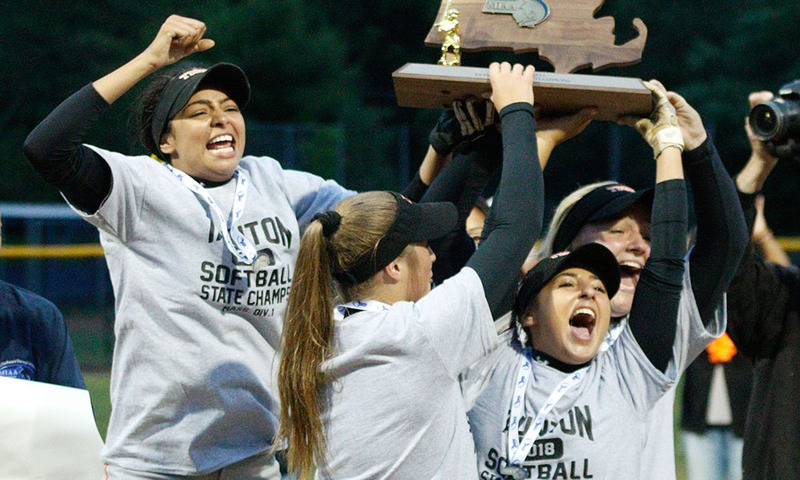 “Emma is clutch, she’s always hungry,” said OA head coach Lindsey Allison. “She’s one of the hungriest players I’ve ever coached. She wants to get it done for her team all the time. She’s a reliable player to have in that situation where you need to put the ball in play. Varella moved to second when junior Katie Abreu beat out a bunt single to put runners on the corners. Abreu quickly stole second uncontested and sophomore Grace Simone plated Varella with a single the middle; Abreu moved to third and Simone to second on the throw. Freshman Anna Balestino tied the game with a bloop single just past first base, bringing Abreu home to make it 7-7 with no out and runners on second and third. Allison elected to put the pressure on the Panther’s defense, calling for a suicide squeeze. Senior Katie Mills pushed a bunt between the third baseman and the pitcher, allowing Simone to scamper home from third for the game-winning run. “We had just a couple of mental miscues in the last two innings, we got a little nervous,” Allison said. “They got some hits and we seemed to get a little nervous. It was unfortunate because we had played so well for the first five innings and with clean defense. After nice defensive plays in the top of the second by Georgeu and sophomore right fielder Mollie Crabtree, the Tigers offense came alive. Mills blooped a one-out single into center and moved to second when Georgeu singled up the middle. Both runners moved up on a sacrifice bunt from junior Abbi Holmes. Mills came in to score on a wild pitch, sophomore Kalei Clark walked, and senior Colleen Larson hit a sharp RBI single to the right side of the infield that had to be knocked down, scoring courtesy runner Elizabeth O’Brien to make it 2-0. Georgeu (CG, 9H, 8K, 1BB) got back-to-back strikeouts in the top of the third, retiring the side in order. Simone led off the bottom of the third with a single and courtesy runner Caitlin Walsh advanced to second on a wild pitch. A single from Mills put runners on the corners with one out. Courtesy runner Sarah Dore stole second and Georgeu drew a walk to load the bases. Holmes hit a hard grounder up the middle that looked like it would bring multiple runs in but Whitman-Hanson shortstop Reese Cordero made a terrific diving stop to get the force out at second and limit the Tigers to just one run on the play. Dore came in to score on a wild pitch and Clark singled to put runners on the corners with two outs. Holmes came in to score on another wild pitch to put OA up 5-0. Georgeu faced just four batters in the fourth and retired the side in order in the fifth. Whitman-Hanson got back into the game with a pinch-hit leadoff single in the fifth, a bunt, an infield error, and a two-run home run to make it 5-4. In the top of the seventh, a single and sacrifice put the tying run on third. An RBI single tied the game, an error put the Panthers ahead, and another base hit made it 7-5. Oliver Ames softball (0-3 Hockomock, 1-4 overall) is back in action on Thursday when it hosts Foxboro.